For Michel Foucault, philosophy was a way of questioning the allegedly necessary truths that underpin the practices and institutions of modern society. He carried this out in a series of deeply original and strikingly controversial studies on the origins of modern medical and social scientific disciplines. These studies have raised fundamental questions about the nature of human knowledge and its relation to power structures, and have become major topics of discussion throughout the humanities and social sciences. The essays in this volume provide a comprehensive overview of Foucault's major themes and texts, from his early work on madness through his history of sexuality. Special attention is also paid to thinkers and movements, from Kant through current feminist theory, that are particularly important for understanding his work and its impact. This revised edition contains five new essays and revisions of many others, and the extensive bibliography has been updated. Preface; Biographical chronology; Introduction: Michel Foucault: a user's manual Gary Gutting; 1. Foucault's mapping of history Thomas Flynn; 2. Foucault and the history of madness Gary Gutting; 3. The death of man, or exhaustion of the Cogito? Georges Canguilhem; 4. Power/knowledge Joseph Rouse; 5. Ethics as ascetics: Foucault, the history of ethics, and ancient thought Arnold Davidson; 6. Michel Foucault's ethical imagination James Bernauer and Michael Mahon; 7. The analytic of finitude and the history of subjectivity Beatrice Han-Pile; 8. Foucault's encounter with Heidegger and Nietzsche Hans Sluga; 9. Foucault and Habermas David Ingram; 10. Foucault's relation to phenomenology Todd May; 11. 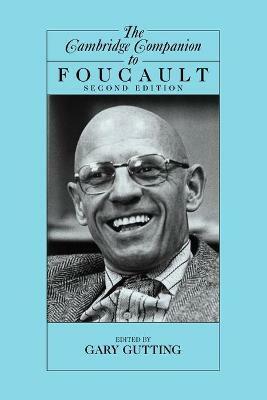 Against interiority: Foucault's struggle with psychoanalysis Joel Whitebrook; 12. Foucault's Modernism Gerald Bruns; 13. Queering Foucault and the subject of feminism Jana Sawicki. Gary Gutting holds the Notre Dame Chair in Philosophy at the University of Notre Dame. He is the author, most recently, of Foucault: A Very Short Introduction and French Philosophy in the Twentieth Century, and is founder and editor of Notre Dame Philosophical Reviews.